Caffeine Increases Power If Taken Before A Workout? Blog Will Taking Caffeine Increase Muscle Power? Caffeine is a natural alkaloid present in the leaves, fruits, and seeds of various plants (coffee, kola, tea, mate, etc.) or can be artificially synthesized. Caffeine is the most commonly used ergogenic drug in the sports world with reports of 75% consumption of elite national and international athletes prior to competition obtained from urine samples. Caffeine used to be ingested via supplementation but has transitioned towards energy drinks in the past few years. Energy drinks typically contain moderate amounts of caffeine (32 mg per 100 mL of product) in addition to carbohydrates, taurine, glucuronolactone and B-group vitamins. Previous studies suggest consuming 3 – 9 mg of caffeine per kg of body mass improves performance in several exercises. The aim of this study was to determine the effects of two doses of a caffeine-containing energy drink of muscle performance during upper- and lower-body power-load tests. Twelve participants ingested 1 – 3 mg of caffeine per kg of body weight of Fure®, ProEnergetics or the same drink without caffeine. The subjects were non-smokers whilst they were light caffeine consumers (<60 mg per day, approximately 1 cup of coffee). After sixty minutes, resting metabolic rate, heart rate, and blood pressure were measured and then the subjects performed half-squat and bench-press with loads of 10 – 100% of 1 repetition maximum with power being recorded. In comparison to the placebo, the ingestion of the caffeinated drink increased mean arterial pressure and heart rate at rest but did not affect the resting metabolic rate. One mg/kg of energy drink with caffeine did not affect maximal power compared to the placebo, but 3 mg/kg increased maximal power in the half-squat and bench-press. The ingestion of 3 mg/kg of caffeine in the form of an energy drink tended to increase the frequency of abdominal/gut discomfort, the incidence of tachycardia and heart palpitations and perceived anxiety. A caffeine dose of at least 3 mg/kg in the form of an energy drink is necessary to significantly improve half-squat and bench-press maximal muscle power. However, this increase in maximal muscle power was associated with an increased side effect of abdominal/gut discomfort. Originally, the ergogenic effects of caffeine were attributed to an enhancement of muscle fat oxidation and thus to a better glycogen sparing capacity derived from the intake of this substance. However, improvements in short-term activities and power suggest caffeine may directly affect the muscle via enhanced calcium ion release from the sarcoplasmic reticulum or enhanced motor unit recruitment by inhibiting adenosine actions on the central nervous system. Caffeine is a highly used ergogenic aid with sports performance implications. Energy drinks are the newest and increasingly popular form of caffeine consumption. Despite this popular increase, long-term health risks and short-term sports performance has only been mildly studied and suggest caution with consumption in regards to sports performance. 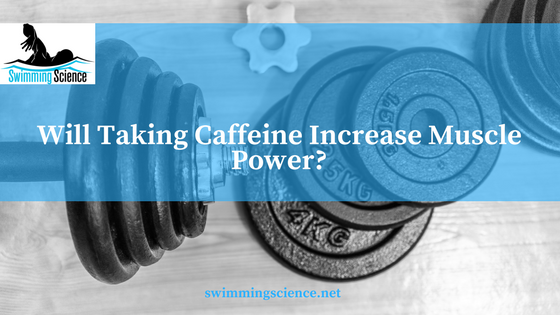 Keep in mind, high use of caffeine is illegal in the sport of swimming, specifically 15 micrograms per milliliter of urine (approximately ingesting 9 mg/kg of caffeine). Del Coso J, Salinero JJ, Gonzalez-Millan C, Abian-Vicen J, Perez-Gonzalez B. Dose response effects of a caffeine-containing energy drink on muscle performance: a repeated measures design. J Int Soc Sports Nutr. 2012 May 8;9(1):21.